BROADVIEW, IL- May 15, 2015 – The spark plug is a key engine system component: it serves to create the electric spark which ignites the compressed air-fuel mixture in an engine cylinder to fire up the engine. A properly functioning spark plug helps reliable starting, guarantees that there is no misfiring, and operates under extreme conditions. Removal or installation of spark plugs on modern vehicles requires extreme precision and care. Each vehicle has a specific change interval for spark plugs recommended by the manufacturer. Not changing the spark plugs at recommended intervals, or replacing them with lower quality spark plugs can lead to a decrease in engine peformance and can compromise the life of the plug. It is, therefore, important to advise your customers to use original equipment quality or better metallurgy spark plugs and to replace them at the manufacturer’s recommended service interval for proper engine performance. Before removing a spark plug check to see if it is still working properly and whether the engine itself is in good working condition -- since both go hand in hand. If the spark plug has excess carbon deposit on it or if it is oil fouled it could be an indication that the engine isn’t running properly which could be due to a number of possible causes. While replacing the worn spark plug can be a temporary fix, it is always better to fix the root cause to ensure that the spark plug doesn’t get damaged again. Before attempting to remove the spark plugs on a vehicle, we highly recommend that you first determine any special instructions by the vehicle’s manufacturer for accessing the spark plugs because engines can vary widely by make and model. Next, you need to have a few very important tools on hand to ensure that damage does not occur to the spark plugs during the removal process. These includea ratcheting socket wrench,a socket extension, and a spark plug socket. A standard deep-well socket should not be used, as it can crack the ceramic insulator. You will also need a torque wrench that is able to measure as low as 10 pounds per square foot. You may need additional tools depending on the vehicle’s configuration. Then, make sure the engine is off and is cool. Engine components can be very hot after running, so be cautious throughout the removal process. Be sure to wear proper protective equipment, including safety glasses and sturdy gloves. There are two different types of spark plug connections in cars: spark plug wires and “coil on plug.” If you have spark plug wires, simply pull the boot off from the base. Make sure you do not tug on the wire too hard as it could cause damage. With coils, you may have to remove some fasteners. Once you’ve done this, simply tug the coil off. If you‘re removing all of the wires or coils at once, mark the spark plug wires or coils to ensure you replace them in the proper sequence. 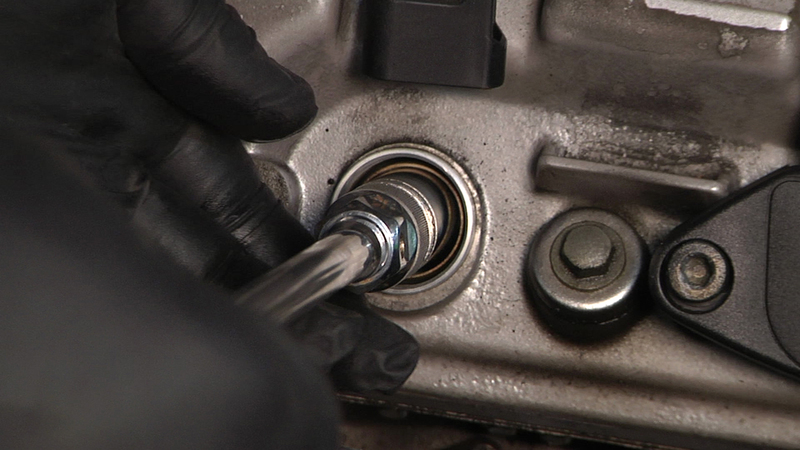 Use a spark plug socket to remove the spark plugs with an extension if needed. Do not use a standard deep-well socket, as it can damage the spark plug. Make sure the socket is the same hex size as the spark plug. Loosen the spark plugs one or two turns, then clean the surrounding area at this time to prevent dirt particles and debris from getting into the threads or the combustion chamber. You may need to apply some force if the worn plug is rusted and wasn’t installed properly previously. If the spark plug is extremely tight, loosen it only a little and use penetrating oil on the threads. Let it sit for about five minutes to allow the oil to penetrate and then attempt to remove it again. Once you have completed the job safely and correctly, dispose of the old plugs according to state and local ordinances. For information on the entire portfolio of Bosch Spark Plugs, visit http://www.boschautoparts.com/auto/spark-plugs. Having established a regional presence in 1906 in North America, the Bosch Group employs some 25,000 associates in more than 100 locations. In 2014, Bosch generated consolidated sales of $11.3 billion in the U.S., Canada and Mexico, according to preliminary figures. For more information, visit www.boschusa.com, www.bosch.com.mx, and www.bosch.ca . *The sales figure disclosed for 2014 does not include the former joint ventures BSH Bosch und Siemens Hausgeräte GmbH (now BSH Hausgeräte GmbH) and ZF Lenksysteme GmbH (now Robert Bosch Automotive Steering GmbH), which have since been taken over completely.